Superior shock absorption, fast non-slip surface and enhanced durability make it the number one choice for most world-class competitions and dojos. Sure-footed support for stepping and kicking drills, set up quickly and offer a professional look with a no-slip surface. 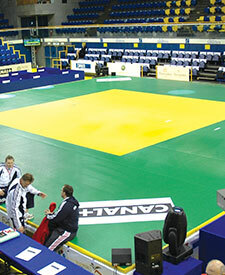 This virtually seamless flooring system is perfect for grappling, throwing and striking martial arts. Fast set-up and tear down makes it ideal for multi-use dojos and gyms. 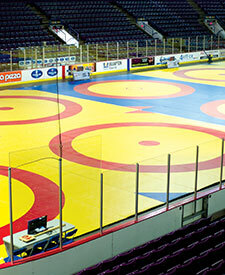 Provide the safest and highest quality mats to your wrestlers with Dollamur wrestling mats. The industry standard for high quality carpet mats. 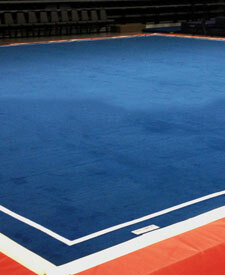 Used in major programs throughout the country and are known to be the safest mats available. 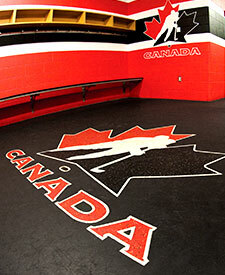 Performance Rubber Flooring is perfect for weight rooms, ice rinks, home gyms, rec centres and more. Whether you need traditional Tatami for Judo, economical Puzzle Mats for karate or customizable Flexi-Roll for MMA, Hatashita's decades of experience will find the perfect mat solution for you. 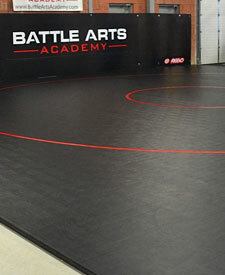 Provide the safest and hightest quality training surface to your wrestlers. Quality, performance and even FILA compliance standards are trademarks of Dollamur Flexi-Roll mats. Our carpet mats for gymnastics and cheerleading are known to be the safest available and are used in training facilities across the country. Order yours today! Put the finishing touches on your training area and increase athlete safety with customized wall mats, pole pads, folding mats and crash pads. Hatashita has the know-how, the experience and the right mats at the right prices. Hatashita is your choice for Training Mats and Safety Flooring in Canada! Contact us today 1-800-586-5836 to learn more or for your free quote.